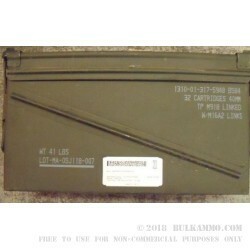 The nicely sized 40mm ammunition box makes an excellent carrying case for all sorts of range necessities or gives you options for your ammo stash for bulk storage of ammunition to protect it from the elements while adding a lot of versatility in transporting it in case it needs to be moved in a hurry or requires protection against environmental conditions. The rubber gasket and swing out carry handle give it excellent storage and transport features and the good condition shows the legitimate durability and long-lasting design elements that made it a standard for the military for so many years. The sizing of this box is as follows: approximately 18.5 inches by 10 inches by 6.5 inches. A nice surplus find, these are excellent for everyday range use or long-term “seal it and forget it” usage. It will excel in either situation. 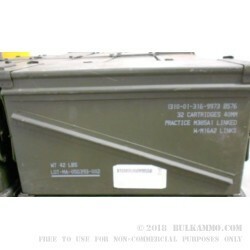 The relative light weight of this ammo can is bolstered by its inherent durability made possible through the reinforced steel design. It is not light, but for the money and the durability it offers a very nice package size and weight relative to its benefits as a transport or storage container.